Editor/Author Palmer Jr., Louis J. 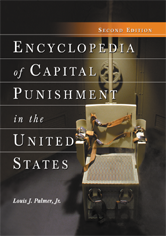 This updated encyclopedia provides ready information on all aspects of capital punishment in America. It details virtually every capital punishment decision rendered by the United States Supreme Court through 2006, including more than 40 cases decided since publication of the first edition. Entries are also provided for each Supreme Court Justice who has ever rendered a capital punishment opinion. Entries on jurisdictions cite present-day death penalty laws and judicial structure state by state, with synopses of common and unique features. Also included are entries on significant U.S. capital prosecutions; legal principles and procedures in capital cases; organizations that support and oppose capital punishment; capital punishmentï¿½s impact on persons of African, Asian, Hispanic, and Native American descent, on women, and on foreign nationals; and the methods of execution. Essential facts are also provided on capital punishment in more than 200 other nations. A wealth of statistical data is found throughout.